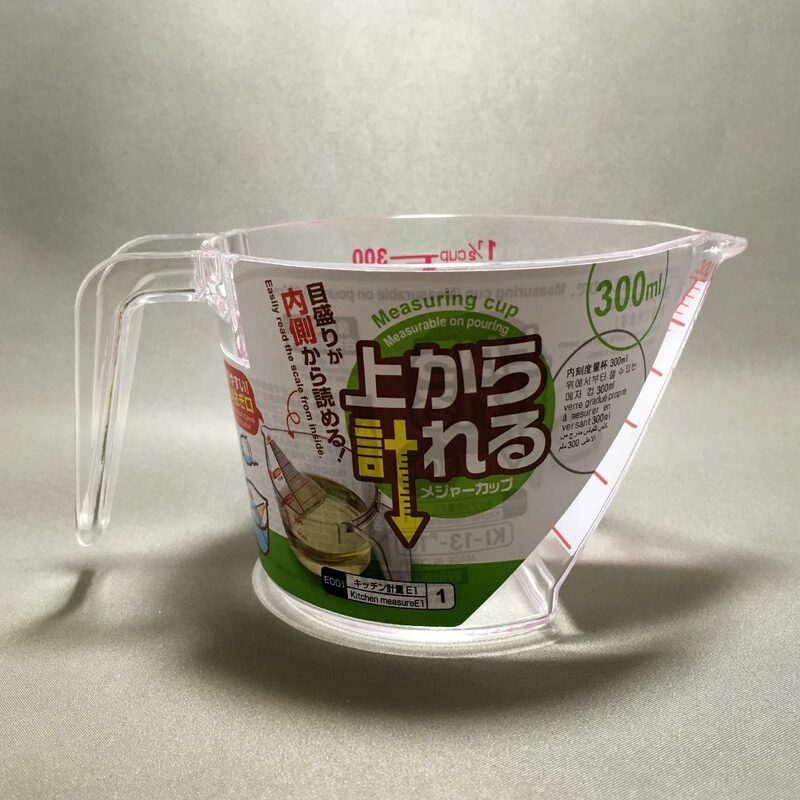 This is a clever measuring cup from Daiso that allows you to read the measurements from the inside. 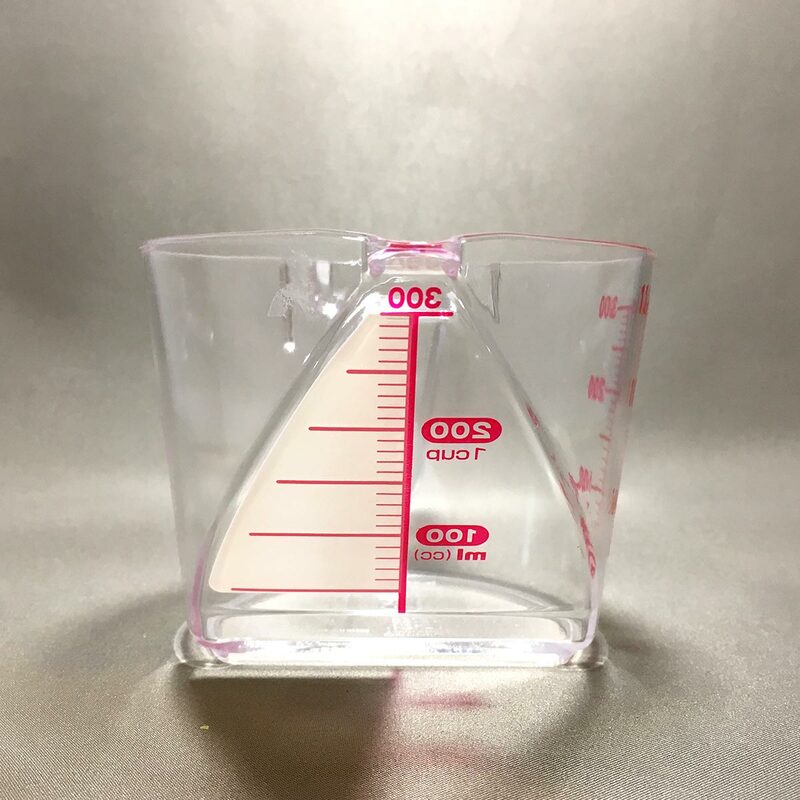 The front of the measuring cup is angled with the scales printed on the surface, allowing you to look straight down to read the measurements while the measuring cup is on the table. 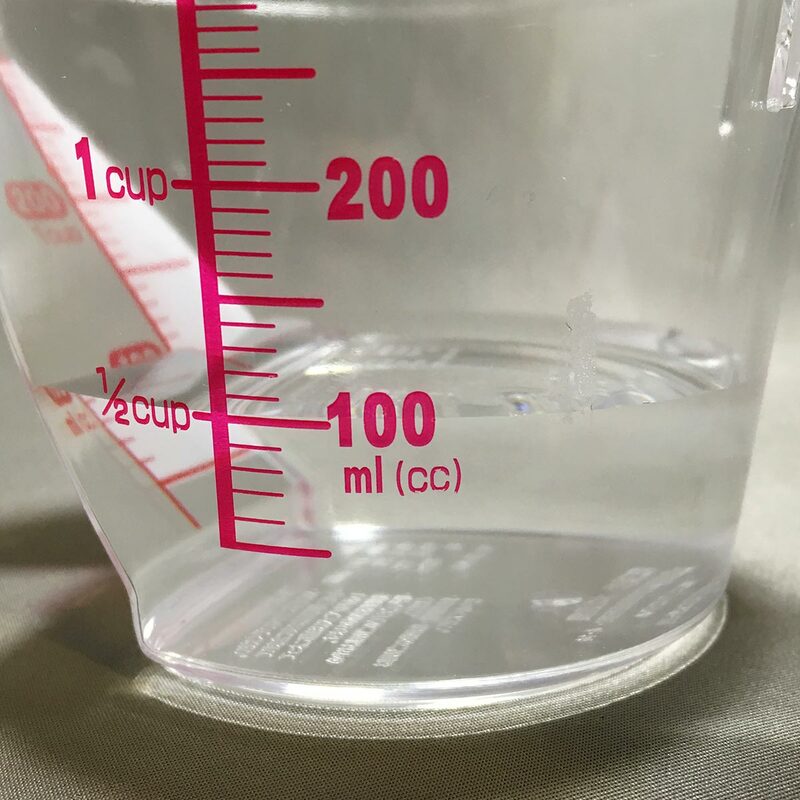 The right side of the angled front has a white background to make the scale markings easier to read. 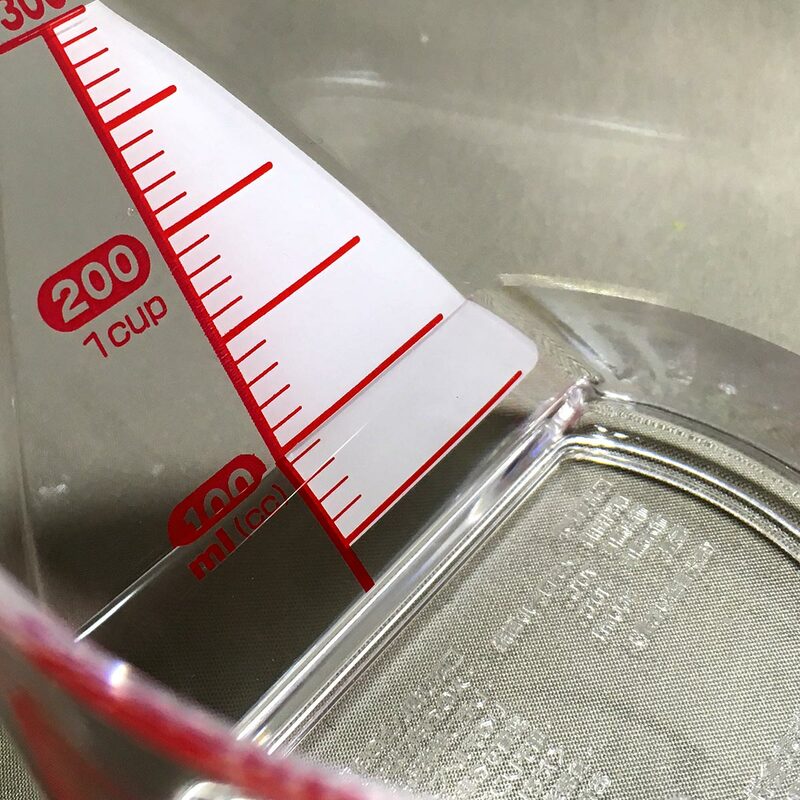 The scales are also printed on the side if you choose to read from the side. 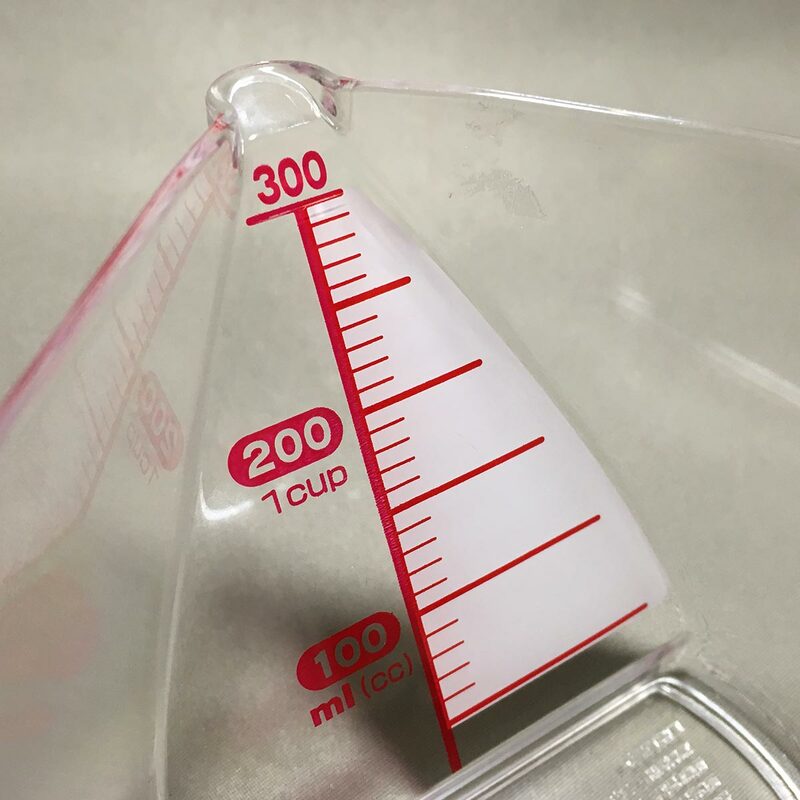 The measurement scales on both the side and inside are in ml (cc) and also in cup volumes. 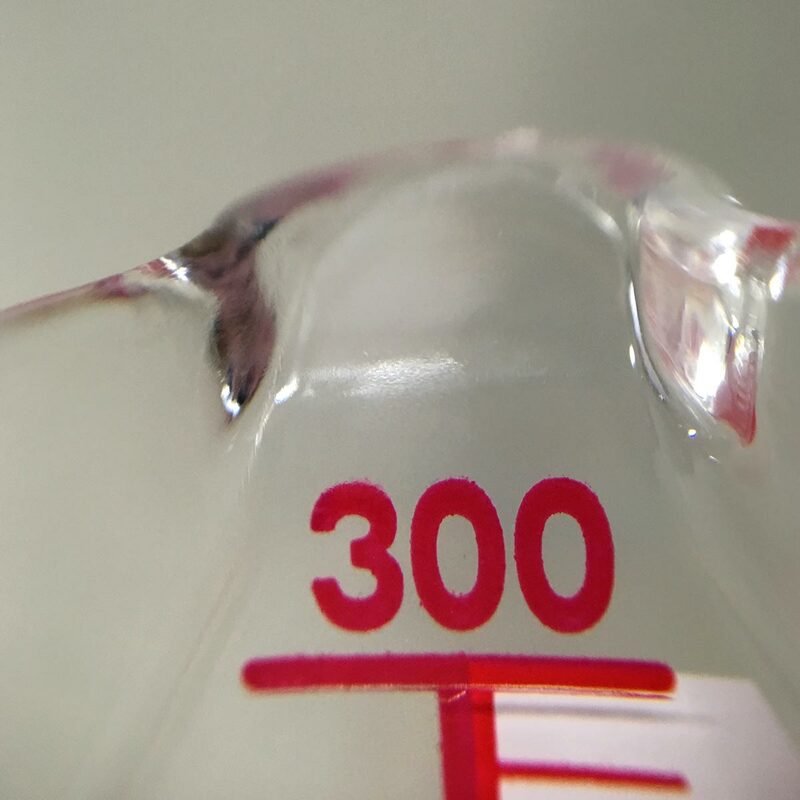 Maximum volume is 300ml or 1 1/2 cups. The spout is narrow making it easy to pour liquid out. 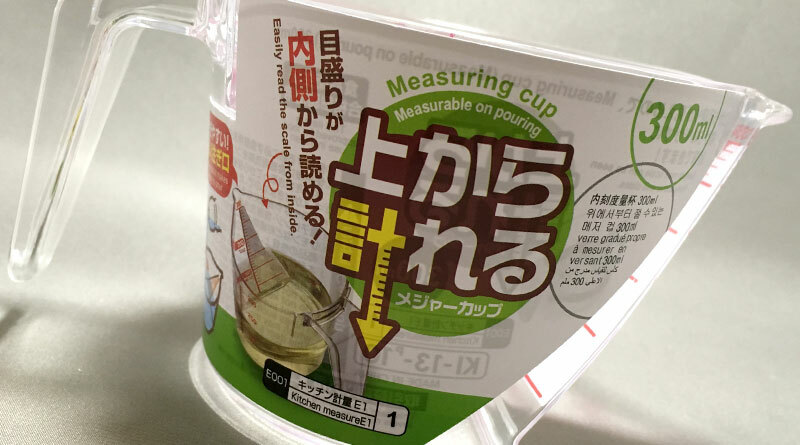 The measuring cup has been approved for food use in Japan. – Wash with dish washing detergent before use. – To clean, use a sponge or soft cloth with dish washing detergent, and wipe dry before storing. – Do not clean with scouring pad or abrasive powder. 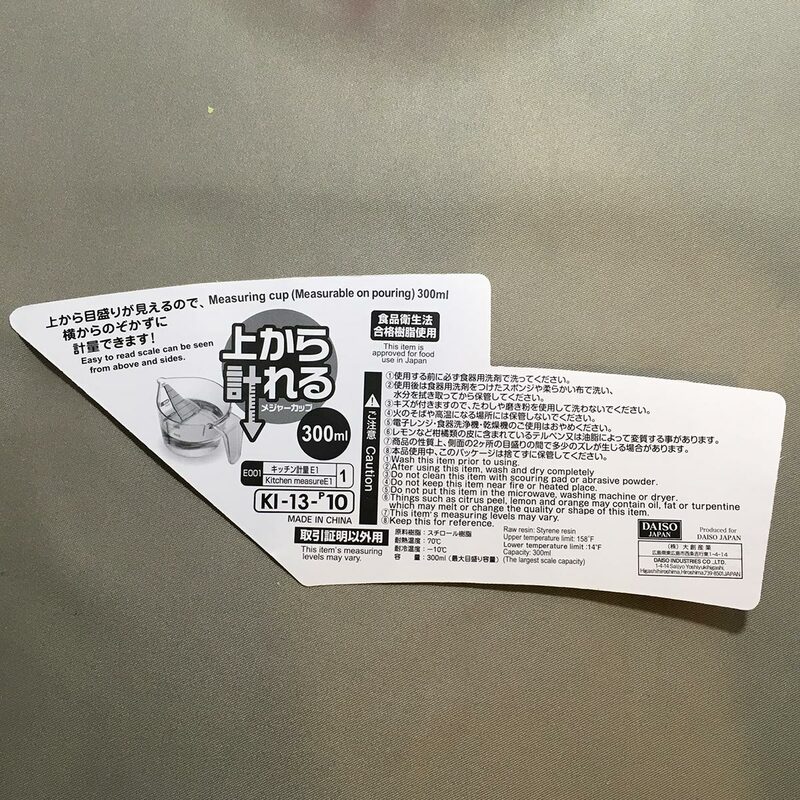 – Do not use in microwave oven, dish washer or dish dryer. 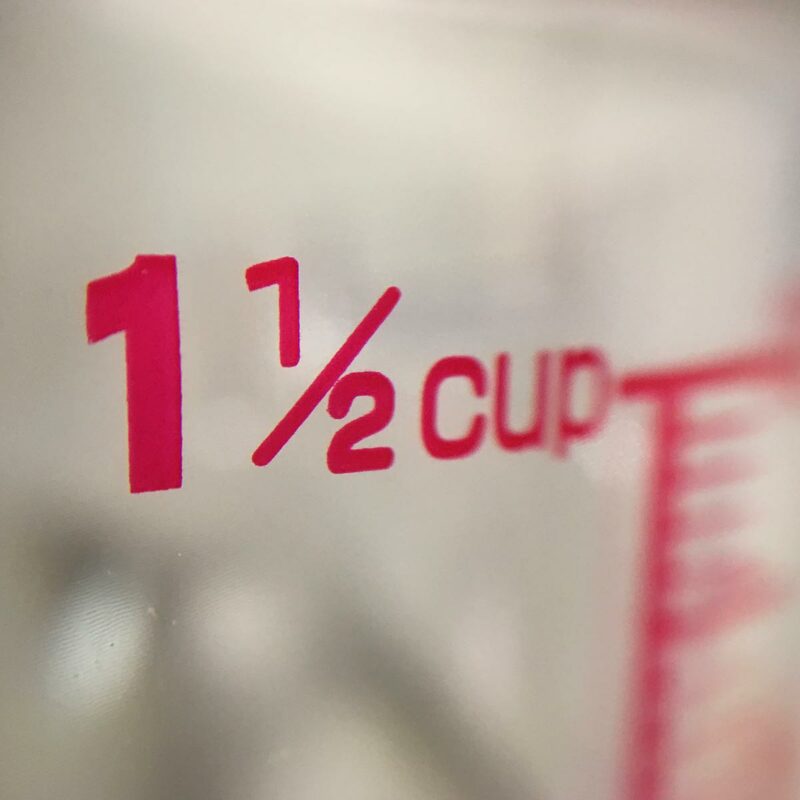 – Lemon or other citrus peels that contain citrus turpentine may damage the measuring cup. – The two measuring scale markings may not match each other. 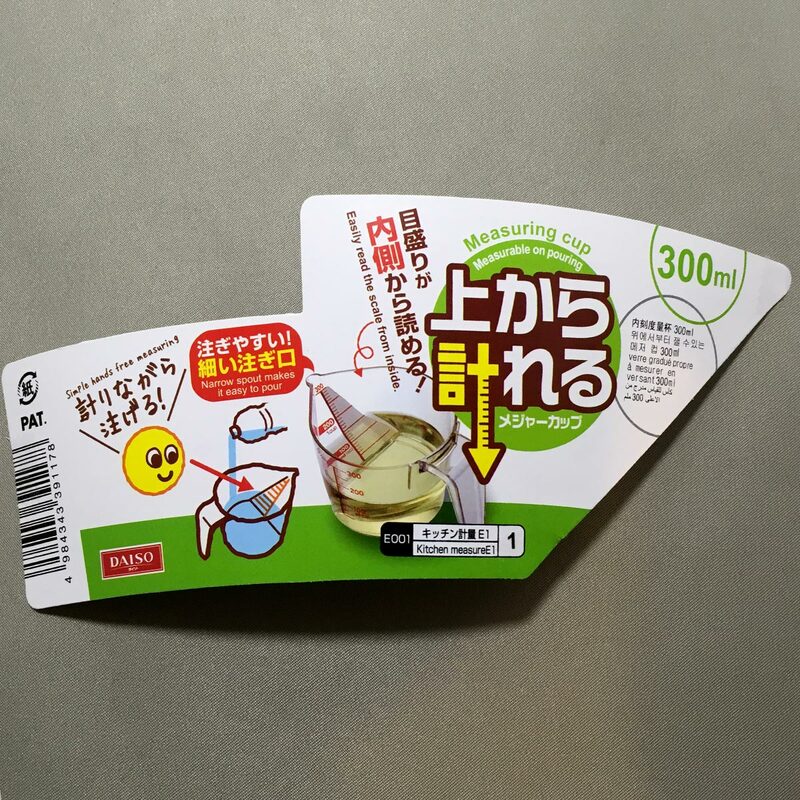 – Retain the packaging label for reference. that has the patented angled surface! I had always wanted to try it, but never got round to purchasing one. 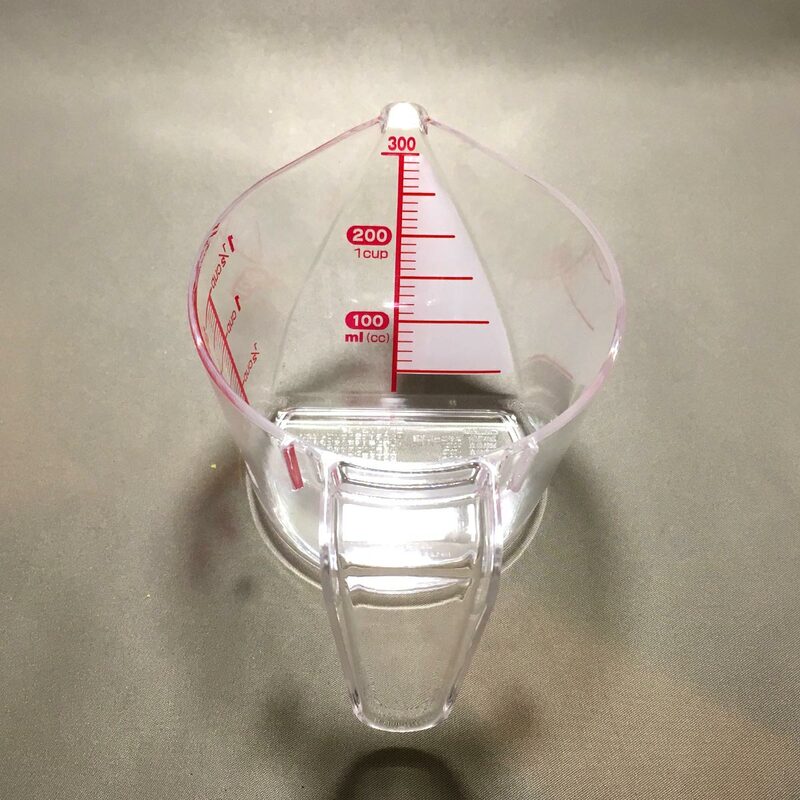 Well, this measuring cup from Daiso is probably the cheaper alternative… the many folds cheaper alternative. I like the design a lot, the cleverly angled front really makes reading the scales easy. The handle is also easy to hold and grip. However, I’m not a fan of styrene food related products. 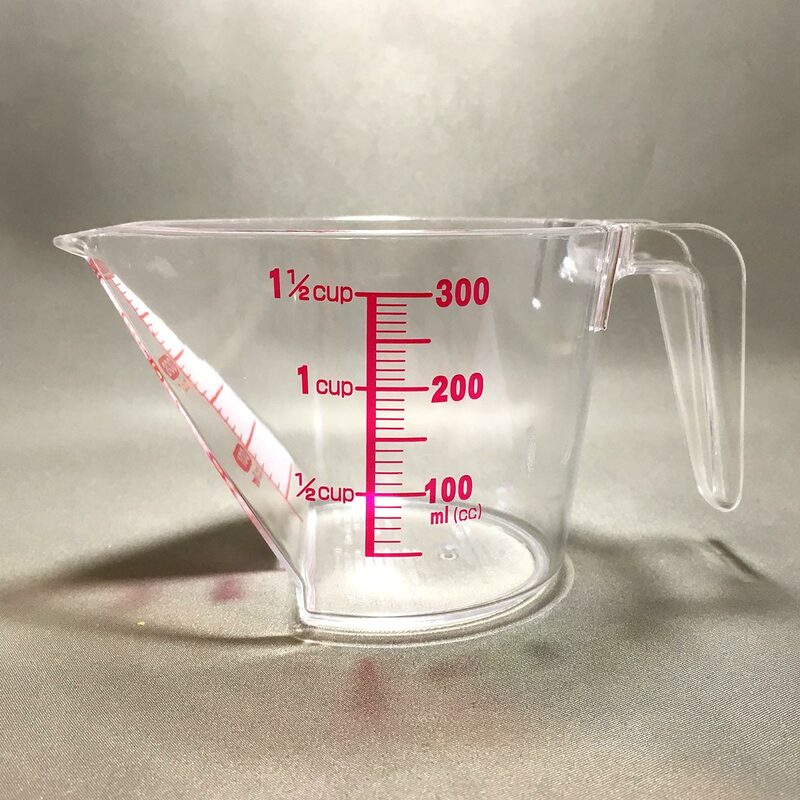 For the same product, I would rather pay more for a measuring cup made from a more solid material such as pyrex. The idea is great, but I’m not going to be a big user of it.